Hello all my fellow tea lovers. Normally, I don’t encourage violence on my blog (or any other place for that matter), but today I am going to put two tea’s in the ring and you can determine who will win in the battle of the Rooibos. Now the reason why I call this the battle of the Rooibos and not a comparison of two Rooibos teas, is because it sounds cooler, and when you are forced to pick between two different teas of the same tea type, it’s kind of like a battle. A delicious battle for your taste buds. Coming to you from The Persimmon Tree Tea Company. Let’s meet the contenders. In this first tea cup we have a tea with a Peachy Kick, we have the Peach Picnic. 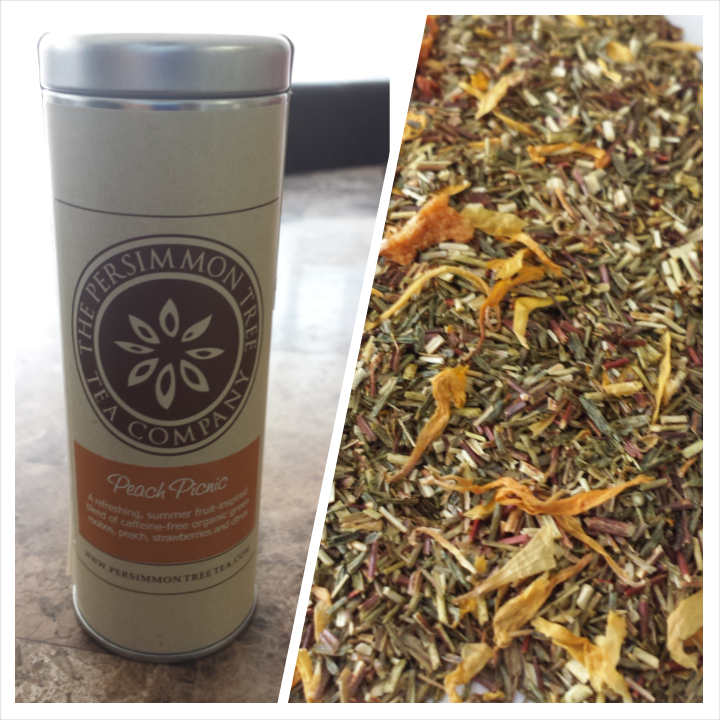 This tea has Organic Green Rooibos, Orange Peel, Sunflower Petals, Natural Peach, Strawberry and Orange Flavoring. And in the other tea cup, we have the two lost ingredients to that sundae I was going to make last night, it’s the Chocolate Banana. This tea is made with Organic Fair Trade Rooibos, Organic Cacao Nibs, Organic Apple Bits, Organic Banana Chips, Pink Peppercorns, Chocolate, and Natural Flavors. Now, here is what I think a winner tea should have, good ingredients, good utilization of ingredients, meaning that the ingredients the company chose to use made sense and did not in any way throw off the flavor of the tea, taste is a must, smell, and tasting of the ingredients, or in other words, can I taste what the company promises is on the ingredients list of this tea? As you can tell, for me personally, ingredients is everything. What makes any food item great, is always the ingredients. Now onto my evaluation. First up is the Peach Picnic. First test was smell. The smell test tells me that this tea definitely has some brightness to it and while I do get the peach flavor from smelling it, I also get a powerful bright, citrus scent as well. I also get a slight floral scent from the tea as well. The next test is the ingredient test. Once again this tea is made with Organic Green Rooibos, Orange Peel, Sunflower Petals, Natural Peach, Strawberry and Orange Flavoring. Now while I am not a fan of the Sunflower Petals, I do like the composition of this tea and think that whoever came up with this flavor profile, knew what they were doing and considered all the factors that goes into making a great cup of tea. This was carefully thought of and not just thrown together on a whim. The next test was the taste test. But since the utilization of flavors test is also a part of the tasting, I’ll kill two birds with one stone. (Note: No Birds were harmed in the making of this tea review). Upon tasting this tea, I got the peachy taste I was looking for. However I see why the strawberry and orange Peel was put into this tea. It needed it. The orange adds a slight brightness that this tea needed. The slight tartness of the strawberry helps to bring out the Peach flavor and make it more pronounce. Which make me wonder: How come they didn’t use Lemon peel and Pomegranates? And while I found the Sunflower Petals to not be needed, I will say that the floral flavor did even out the tea and the flavor profile perfect. I did however have to use more product than the directions called for. I don’t know why, but when I first followed the directions to make this tea, it came out bland, and almost flavorless. Adding more product definitely fixed the problem, but the real problem is the loss of cost effectiveness if you have use more product. Last but definitely not least is the Chocolate Banana. First test was the smell test as well. While I did smell the chocolate, and I did pick up on the fruity scent, I could not identify it as banana, and the peppercorn kind of threw the scent off (and the taste) of the tea. There is however a nice crisp-like scent. I think it’s coming from the apples, which I found to be very interesting, but it’s probably also why you can’t really identify the banana smell. And a small warning for my fellow sweet tooth’s, this tea smells SWEET. But I will give this the benefit of the doubt because bananas are really subtle in smell anyway. Let’s get onto the ingredients. 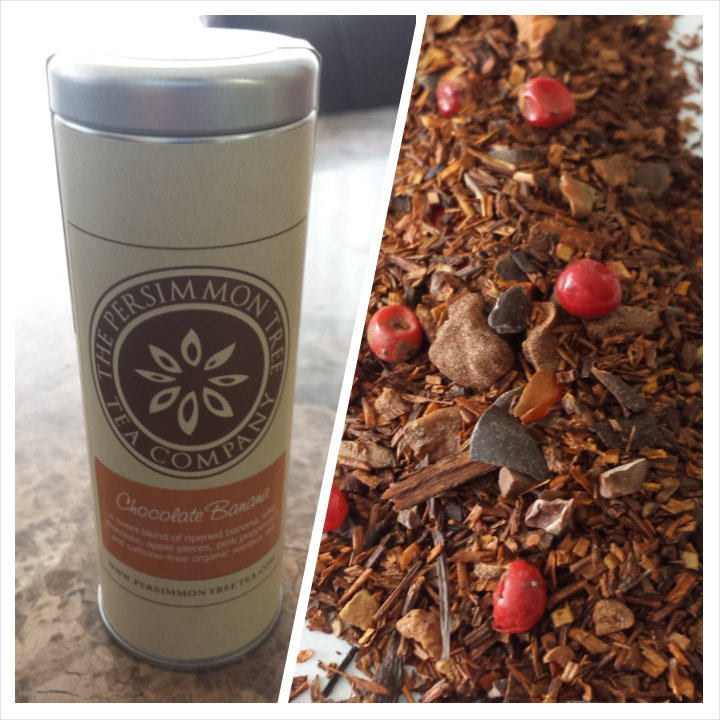 One again, this tea is made with Organic Fair Trade Rooibos, Organic Cacao Nibs, Organic Apple Bits, Organic Banana Chips, Pink Peppercorns, Chocolate, and Natural Flavors. This tea passed the ingredient test with flying colors. Its simplicity in flavors was very unique. The chocolate and the banana are an amazing combo. And the apples gave it that nice crispness that was needed to make this tea some together so nicely. You guys are probably wondering “Didn’t you forget the peppercorn?”. No I didn’t. Because the ingredient utilization test will solely point only to the peppercorn. Not only do I not like it, but I would like to know why it’s in here? It throws off the tea completely by somehow altering how the taste buds should interpret the other ingredients. So much so, that you can smell the difference, let alone from tasting it. Now onto the taste test. I enjoyed the chocolate, the banana, and apples that where in this tea. It was rather difficult to spate the two fruits, but I won’t make too big a deal of it, because they fruits compliment the chocolate and add to the pleasantly sweet taste. The only real complaint that I have about this tea, is of course the peppercorn. It throws off the tea and makes it taste a little weird. However despite that, I like the flavor profile. The smoothness of the chocolate contrasts well with the fruity note of the banana and apple. I just didn’t enjoy the peppercorn. Of course I am going to leave this one up to you to decide which tea you think should win the battle. The Products in this review was given to me courtesy of The Persimmon Tree Tea Company for testing/reviewing purposes only. This is NOT a paid review.